Anybody following OCZ Tech (OCZ) knows that rumors have been swirling that Seagate Tech (STX) has made a bid to buy the company for over $1B. Well the rumors suggested that the deal would be announced on Monday during the Q212 earnings report for Seagate. After the close on Monday, Seagate reported disappointing numbers that sent its stock down some 8%. Unfortunately though for OCZ shareholders no mention was made of the OCZ buyout. Not even a question from analysts regarding the rumors. Not to much of a surprise but the stock plummeted during the regular session and even further after hours. Closing at $5.36 most of the rumor gains were gone. Then the story gets strange. While the CEO was busy claiming no real need for buying technology, the CFO trots out late and tells Reuters the desire to purchase a SSD company. Within a span of hours, the company appears happy with the in-house program to suddenly needing external sources. Note the higher highs and lower lows over the last two months very much indicating a breakout. The small cap Russell 2000 has not had the same outcome. While not too far behind the large caps, the smaller cap index still remains below the July peak at 820 and further behind the end of March top around 850. Prior to the market open on Wednesday, ConocoPhillips (COP) reported earnings that generally beat significantly reduced estimates. This earnings report was more interesting than normal since it was the first independent report since the company split from Phillips 66 (PSX). Following completion of the split, ConocoPhillips claims to now be the world's largest independent exploration and production company, based on proved reserves and production of liquids and natural gas. After last quarters disappointing earnings report, this once high flying maker of motion sensing technology dropped 50% to $9. On the previous conference call, InvenSense (INVN) spoke of a bright future amid a hiccup in the supply chain that was limiting the ability of handset makers to utilize the motion sensing technology for 4G LTE phones. Hard to justify the major selloff when the problem was well known to be caused by a major supplier by the name of Qualcomm (QCOM). Fast forward to Q113 earnings and InvenSense reported numbers slightly above estimates. The company also guided to sequential revenue growth of roughly 40% which should capture investor attention. Not to mention, the results continue to be impacted to the tune of $3-4M by the known issue with 28nm chips provided by Qualcomm. Verizon Communications (VZ) continues to be able to squeeze out costs from a slow growing revenue base. Though Q212 revenues only grew 3.7%, the bottom line grew by 12.3%. This gain was largely due to a reduction in the cost of services and sales by $262M combined with a $38M reduction in interest expense. Verizon is a global leader in delivering broadband and other wireless and wireline services to consumer, business, government and wholesale customers. Verizon Wireless has more than 94M retail customers though it is 45% owned by Vodafone (VOD). Though operating efficiency continues to improve the most concerning part has to be that wireless revenue is only increasing 7.3%. If Sprint (S) ever becomes a more formidable competitor, Verizon might see the ability to lower costs and improve margins come to an end with little growth to spare. Last Friday, oil services companies Baker Hughes (BHI) and Schlumberger (SLB) reported earnings that helped drive up the Oil Services Index (OIH) by 1.2%. A strong performance considering the market was weak with the S&P 500 falling more than 1%. If anything, the price jumps were more based on a relief rally that the industry didn't keep falling off a cliff after a very weak start to the year. Stocks in the sector, including Weatherford International (WFT), had been trading close to two year lows. The industry in general had been undergoing a boom with demand for more complex and time consuming drilling, completion, and pressure pumping services due to drilling deeper wells in more harsh conditions or requiring more complex techniques due to horizontal drilling versus the previously more common vertical drilling. Disclaimer: Long WFT. Please review the disclaimer page for more details. The stock of Riverbed Technology (RVBD) had been absolutely decimated over the last six months as the company reported back on the Q411 report in January that it would be going through the growing pains of a massive new product cycle. The stock dropped from $30 to $24 in January before rebounding back to $29 before falling off the cliff when Q112 results again disappointed. (See How Did A $5M Revenue Cut Turn Into A $1.35B Market Value Drop? article.) The company though remained resolute that the new product cycle and more importantly the important WAN Optimization market remained strong. After the close on Tuesday, the company reported Q212 numbers that blew past analyst estimates, sending the stock up over 20% after hours back above $18. Kayak (KYAK) went public in an IPO at $26 on Friday. This price was above the original $22-$25 range and raised $91M for the company. The stock opened up 15% at $30.10 and now trades in the $33 range. The company proclaims itself as the best place to plan and book travel. The basic focus of the company is to enable people to easily research and compare accurate and relevant information from hundreds of other travel websites in one comprehensive, fast and intuitive display. The initial thought when the company filed to go public was that of just another internet travel company. My past experience on the website wasn't that impressive though my last visit went back a few years. At the time it was vastly underwhelming to use or at least that was my experience. After the close on Wednesday, Mellanox Technologies, Ltd. (MLNX) reported quarterly numbers that sent the stock soaring as much as 50% after hours. A very incredible and unheard of move for a stock with a $2.7B market cap. A move typically only reserved for FDA approvals on biotech stocks or buyouts. Mellanox is a leading supplier of end-to-end interconnect solutions for servers and storage systems. The company claims to have benefited from growth in the HPC, Web 2.0, storage, database, cloud, Big Data, and financial services market. Basically every part of tech that is hot except maybe that last one. As Velti (VELT) hits recent lows below $6, investors are left pondering the reason for the sell-off. Especially considering every indicator points towards a robust market for mobile advertising, especially with the advance of the tablet. Velti is the leading mobile advertising and marketing technology and solutions provider for brands, advertising agencies, mobile operators, and media companies. Its Velti mGage platform allows its customers to use mobile and traditional media, such as television, print, radio, and outdoor advertising to plan, execute, monitor, and measure mobile marketing and advertising campaigns that reach consumers through mobile internet applications. Part of the reason for the concerns is that Velti is faced with a technology investor base that doesn't understand the receivable history in the advertising agency sector. The company hosted a financial conference call to discuss the large receivables, but that never helped the stock price. After eight rate cuts totaling 450 basis points to a record low 8%, the Brazilian economy and stock market are still struggling to regain the growth of the last decade. Read this CNBC report for more details on the economy and interest rate cuts. Surely, now has to be the time to invest in this country. The Bovespa (BVSP) now trades close to 3 year lows, only trading slightly lower in the August to October 2011 time frame last year. So why aren't the rate cuts propping up the stock market? For one, the market doesn't appear as forward-looking anymore. The original rate cut didn't happen until August 2011, meaning that it is just now impacting the economy. Unfortunately, it hasn't prevented the forecast for the economy from dropping to 2.5% now. Until this trajectory returns to increased growth, stocks probably won't move up much. Disclosure: Long NIHD. Please review the disclaimer page for more details. It still amazes me that the prime method of saving for retirement is a closed system that allows limited investment options chosen by the employer where highs costs aren't disclosed. Clearly the 401(k) system is better than nothing at all and the old pension system. It just needs to be modernized to catch up with the current fast paced world. When I left Verzion a couple of years back, the whole process of moving my 401(k) out of the control of Verizon and into a IRA at Fedelity was enlightnening. As somebody interested in the stock market and becoming a financial advisor it was always very frustrating to see my wealth accumulating in a 401(k) plan with little ability to direct my investments other than basic mutual funds. Verizon of course had a strong plan compared to most in the industry with a high matching contribution and a decent selection of funds. Unfortunately though it didn't always provide the options that I wanted and expenses weren't readily available. Duke Energy (DUK) made significant news recently with the resigning of new CEO right at the closing of the merger with Progress Energy. The news was mind blowing considering the deal with shareholders, regulators, and consumers was that Bill Johnson from Progress Energy would run both companies with former Duke Energy CEO Jim Rodgers moving up to Chairman. How does this impact the stock? Outside of political and regulatory noise, it shouldn't honestly have a huge impact. Utilities are complex businesses, but it only takes a solid operator to run them. Jim Rodgers will have no problem running the merged entity. In fact, Jim Cramer remained bullish on the stock especially considering the stock price drop. On Thursday night, Darden Restaurants, Inc. (DRI) announced a $585M cash transaction to buy Yard House USA. Is this a signal that growth at Darden restaurant mainstays such as Olive Garden and Red Lobster has peaked? Darden Restaurants, the world's largest full-service restaurant company, owns and operates nearly 2,000 restaurants that generate $8.0 billion in annual sales. The company is headquartered in Orlando, Florida, and employs 180,000 people. The restaurant brands include Red Lobster, Olive Garden, LongHorn Steakhouse, The Capital Grille, Bahama Breeze, Seasons 52, and Eddie V's. In reaction, the stock declined a little over 1% in after hours. The market appears mixed on the deal so far. After the close, Marriott International (MAR) reported inline earnings and slightly lower revenue. The stock appears to be selling off slighting in after hours. More importantly to Stone Fox Capital was the announcement of spending $400M on share repurchases. This number was slightly above the Q211 numbers helping push up the Net Payout Yield (NPY) just slightly. The fundamental news for Q212 was decent with REVPAR holding up. The company has apparently guided down slightly for the rest of 2012. On a fundamental basis, the stock will likely trade weak for a while. On a NPY basis, the stock is a huge buy on any dips. Marriott clearly isn't worried about any long term weakness from the 2H of the year. The company spent the largest amount on repurchases for the last 3 quarters. News came out from Flightglobal today that AerCap Holdings (AER) has placed itself on the auction block. With the stock floundering in the $10-12 range for the last few years, it wouldn't surprise me if big investors would be willing to walk away with a sizable premium. AerCap is the world`s leading independent aircraft leasing company and has one of the youngest fleets in the industry. AerCap has a portfolio of 350 aircraft with a focus on fuel-efficient narrowbodies and widebodies. AerCap is a New York Stock Exchange-listed company (AER) headquartered in The Netherlands with offices in Ireland, the United States, China, Singapore, and the United Arab Emirates. Before the open today, Campbell Soup (CPB)announced a $1.55B deal to purchase Bolthouse Farms. The deal gives Campbell access to the rapidly growing market for packaged foods. The deal is expected to be accretive by $.06 in 2013 with the use of cash and/or debt to finance the purchase price. Founded in 1915, Bolthouse is a vertically integrated food and beverage company focused on developing, manufacturing and marketing proprietary, high value-added natural, healthy products. The company has leading market positions in fresh carrots and super-premium beverages in the U.S., along with a growing presence in refrigerated salad dressings. This model was up 5.2% in June versus a 4.0% gain for the benchmark S&P 500. As expected the model jumped back after a weak May as investors jumped back into high yielding stocks. Trade No trades were made this month, but several stocks remain on the radar to sell as dividend stocks continue to outperform the market. Some of these stocks are reaching valuation levels were capital gains are likely to be limited for possibly the next few years. Bottom Performers With a strong market in June, it is always worthwhile to review the losing stocks to confirm the long term story remains intact. The model ended the month with 26 stocks, which is slightly higher than normal, and only two stocks had a negative price change. In a world of constantly changing financial data and press releases, investors need to be able to interpret the differences between two seemingly similar announcements. Over the last couple of weeks, two hot technology companies announced public offerings with completely different implications to shareholders. First, 3D Systems (DDD) announced a $100M secondary on June 12th with proceeds to be used by the company to finance acquisitions and working capital. Second, Splunk (SPLK) announced a $300M secondary on June 27th where existing shareholders are selling shares with no proceeds going to the firm. The benefit to shareholders is the increase to the public float. Notice that both scenarios involve insiders of the company with major shareholders or management concluding that the stock is an attractively priced currency to utilize. One wants to utilize the cash to grow the business while the other wants to cash out and exit the business. According to this Bloomberg report, Brazil expects to continue cutting the interest rate by 50 basis point intervals for the time being. The Selic rate is already at a historical low of 8.5% after five rate cuts. Yes, you read that correctly. From the chart below, the interest rate has averaged 16% since 1999. An incredibly high level when you consider the rates in the US or Germany. Heck, the 10 yr Treasury in Italy and Spain doesn't even match 8.5%. The amazing part is that the Bovespa trades closer to 3 year lows than highs. Shouldn't the significantly lower rates spur growth and investment demand? Well that use to be the theory but investors appear less forward looking than in the past. Just as the higher rates in 2011 hurt growth these rates should fuel growth. Unfortunately any gains are likely to lead to a spike in the markets followed by sharply higher interest rates. The drastic cuts by the government are going to lead to volatile times. 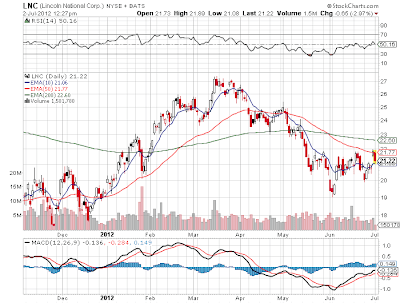 Ok, Barclays Capital didn't downgrade Lincoln National (LNC) for being too cheap. One has to wonder if the stock trading around .4x book value actually played a roll. Or maybe these analysts just use recent history as a basis for price targets. Honestly don't understand how a price target below book value could ever be justified. The company has made at least a $1 in each of the last 4 quarters and trades at 4.7x forward estimates. In what book is that a stock to sell? Even worst is the Daily Political website throwing in the P/E ratio of 30 to make the analyst call appear smart. Not sure why that website is even commenting on stocks, but it had the most detail that I could find on the downgrade. While the stock is down 3% today, the bounce off the 10ema will be bullish if it holds. Also, the stock came close to closing the gap from Friday just below $21. 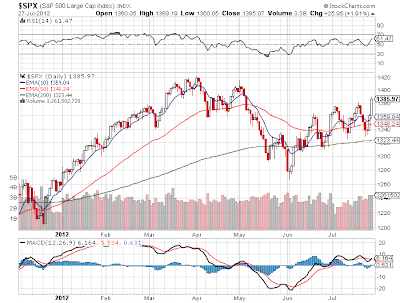 Anybody buying at these levels at least has limited risk if it goes ahead to fill the gap today or sometime this week.